Yesterday's article, AIG needs to be taught who's boss resulted in a flurry of reader comments. One, by reader Val Beakley caught my eye. He complains that AIG hasn't reimbursed his wife for her medical insurance expenses. Obviously, there's likely more to the story, but that got me thinking. How responsive has AIG been to its insurance customers? In return for all the bailout billions we've given them, have they actually been supporting their customers and honoring claims? If you're an AIG customer, please post a comment and let us know. To be fair, if you've had a good experience with them, let us know that as well. I am so tired of hearing that AIG is 'too big to fail'. Isnt it true that AIG holds the retirement for congress? Congress immediately shoveled money into AIG for a few reasons, but the biggest was to cover their own back sides. AIG has contributed almost a quarter of a million dollars into Senator Dodd's campaign funds, amazingly enough, Senator Dodd put the amendment into the stimulous bill which allowed the AIG execs to receive these huge bonuses. Maybe if we let AIG fail, every congressman and woman would have to turn to social security. If that happens, you know Social Security would be fixed very quickly. I think they should change what AIG stands for.... hmmm, maybe "Agents in Greed". If they're anything like Humana (which is anything BUT what the name implies) they probably screw their policy holders as well. As a lawyer who represents small businesses, I can relate of my experience in handling a claim against AIG under uninsured motorist coverage and personal injury protection (PIP) coverage for my client. When I had notified AIG of the claim in March 2008, it had assigned an adjuster to the case. But when I had submitted the medical claim and supporting documents in June 2008, I never heard a response back from the adjuster and then called him in August 2008 to find out that he was no longer working in that department and that he had closed out the claim in March 2008 (after receiving notice of claim from me on the same day). I had notified in writing to the manager of that department and claimed bad faith; AIG immediately paid out the medical payments undeer the PIP but has not paid out under the uninsured motorist coverage as of yet. If you have to send anything to AIG for your claim, then you will need to do via certified mail, return receipt requested (in order to document the timeline in case that you need to file a bad faith action against AIG). Contact the insurance department in your respective state to find out what your rights as insured for bad faith violations by AIG as I am sure that there will an increase of these claims against AIG. I have concerns with my AIG/Valic account – whether to pull the funds out or keep them put. I have an annuity account. – life savings retirement fund. Not a lot $ but all I got. I figured it would subsidize my retirement since social security is not enough to substain me. If I were to withdraw my retirement money AIG will penalize me with a substantial early withdrawl charge. I hardly feel this is fair given the current events of three bailouts and now huge bonus payouts on the backs of taxpayers. How many times in how many ways do they want to get our money? Gee give me a break! Is there anything that can be done to elimate these early withdrawl fees in the short run given the current circumstances.????? I have written to my senators and President Obama regarding this issue. I know they have a lot on their plates, but we the taxpayer are the meat and potatoes of this country. We have made this country good by our hard work and determination.- not by sitting on our butts deceiving people and receiving bonuses for poor performance. We are all fed up!!!!!! We do not want banks to any longer control our lives. Nor do we want all ther jargon and 10 page pamphlets in the mail on how they are going to screw us (if you can read the fine print to begin with) Enough is Enough!!!!! don't want school to be at a price that we can go and better our self or hospital program like Canada or a job after all they said the we contribute 70% of the economy of this beautiful country, so we can have a few @#$%& bring it down on it's needs. Steve: It doesn't matter if you mess up--with AIG--you still get your bonus. A 92 year old widow of a former NYC Union (DC37) is hood winked to the tune of $8,670.00 by AIG. This is current and on-going and details are available. 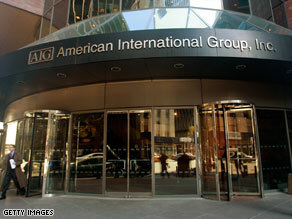 AIG are abusing, enough is enough, but yesterday, Americans knows what happen last summer and are waiting for evidence. AIG,, 11 people gone,, are they hiring,, i need a better job and better bonus's. and i don't mess up once trained. It would be very interesting to see the responses-–and I would surely like to know--since I owned a portion of AIG.